Manly SEA LIFE Sanctuary is a compact, but thoroughly worthwhile aquarium conveniently located only a few minutes’ walk from the Manly ferry wharf. It has plenty to occupy the whole family and is perfect for primary school aged and younger children. The circular centre is built over three levels, unfortunately there are no lifts so you will need to park your pram in a dedicated area and carry smaller children. The lower level contains viewing tunnels from where you can watch a variety of sharks, rays, turtles and fish. Luckily we arrived just in time for the Shark Harbour tour. All the staff we met where passionate and keen to engage the children, as well as being full of interesting information. The underwater viewing tunnels are fascinating and as it is a circular venue, easy for the children to explore at their own pace. Despite being a beautiful Saturday afternoon the centre didn’t feel crowded and we were free to wander at leisure. We particularly enjoyed watching the sharks and rays, and hearing that one of the rays is as big as a queen bed! In the lead up to Halloween, Manly SEA LIFE Sanctuary is offering a Spooky Seas event. Children can follow a quiz trail around the centre and discover which animals have no blood, heart or brain and what colour octopuses’ blood is! Whilst fun and entertaining the centre is also focused on conservation, working to rehabilitate injured animals, participating in breeding programs and also spreading the message on how we can all individually look after our oceans. The upper level of the sanctuary is home to Penguin Cove and a colony of Fairy penguins with names as diverse as Magneto, Hugo Boss and Huey, Dewey and Louie. The penguin talks (held twice daily) are highly recommended as the penguins are hand fed and very active. The views from the picture windows in Penguin Cove are also worth admiring. The middle level of the centre contains some varied and unique species. Of course there are sea-jellies and sea-stars (for those not in the know, “fish” has been dropped from the name of starfish and jelly fish, as neither are actually fish), turtles, crocodiles, octopuses, and cuttlefish round out the displays. The children all really enjoyed the discovery rock pool. Once again the staff were amazing, guiding the children and the adults to discover the unique attributes of the sea life on display (who knew shark eggs were spiral in shape) and even making adjustments for tiny arms to also participate. And finally no aquarium would be complete without a tropical tank featuring the all-star cast from the Nemo and Dory films. Many of the tanks in the centre featured wide plinths at the bottom, perfect for children to stand or sit on while they watched the fish. My children sat for 20 minutes – noses pressed right up to the glass as they watched the clownfish and his friends dart around. The Manly Sea Life Sanctuary was definitely a hit with adults and children alike. It was great to see all the sea life up close and personal, additionally there is a Shipwreck shores playground and a craft area. The Manly Sea Life Sanctuary had it all, big impressive sharks, tiny little seahorses, interactive areas, and species we had never seen before. But the knowledge of the staff, the underlying message of conservation and watching the children ask questions and learn was a highlight. - You will have to park your pram on the middle level as you enter so be prepare to remove your valuables and carry small children. - Take your time on each level, or come back again and again. There were many things we missed in the excitement of our first wander that we only saw when we revisited. - You are not discouraged from taking food in, so pack a few snacks to entertain the children while you sit and watch the fish. - Take in as many of the talks and tours as you can. They were great for learning all about marine life and the kids enjoyed hearing the names of the individual animals and stories about their lives. - Your entry ticket is valid all day so you can enter and exit at will, to visit the sand and beach right outside the door or pop over to the wharf for lunch. Spooky Seas at Manly SEA LIFE has now ended. I am a Sydney-sider born and bred, but spent 12 years living in Wagga, Canberra and London. I am married to an Englishman and we have three children, Eli age 6, Allegra nearly 4 and 16 month old Cooper. 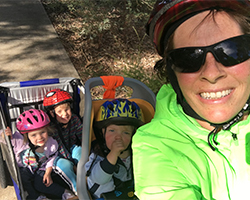 I am a work-from-home-Mum and keep myself sane by getting out and about and exploring all that Sydney has to offer. The kids and I enjoy parks, museums, picnics, playgroup, gardening, walking, cycling and road-tripping. I am the typical “crafty” mum and love getting my hands dirty, taking photos, and running (sort of).